Chiana is an alien female from Nebari Prime. She is a headstrong, acid-tongued survivor, and entirely self-sufficient -- a true self-preservationist and an artful scammer. This edgy exterior, however, hides emotional vulnerability; a sarcasm-tinged sense of humor, and a wide-eyed adventurous spirit. Able to slide effortlessly into any persona she chooses, she's equally comfortable in penthouses and back-alleys. When she first came aboard Moya, she was quick to size up Crichton and the others for whatever benefits she could wrest from them. 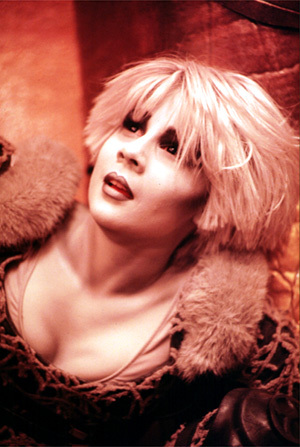 However, the more time she spends on Moya, the more Chiana comes to respect them, and as time passes, she's actually hammering out her own niche aboard the ship. She is happiest when she has the opportunity to show off her scoundrel skills; she's a thief, a liar, a seductress and a drama queen. But beyond that, she's a very young woman, and often conceals her fears under blustery pseudo-confidence that's plausible maybe fifty percent of the time. Her talents for subterfuge have proved useful on more than one occasion for Moya's crew, but her tendency to be contrary makes her an unlikely team player in crisis situations. Chiana doesn't do what Chiana doesn't want to do, and as a general rule, that's anything that would risk her hide, ruin her reputation, or tear her clothing. Unless of course that's what she was going for.